Timmy Time is a spin off from the Shaun the Sheep animation which introduced the Timmy character, Shaun the Sheep itself a spin off from the Aardman Animation series Wallace & Gromit, which introduced the Shaun character. Since the animation was broadcast on Playhouse Disney, Mayenne is hooked. There is no dialogue, just animal sounds, and that’s the beauty of it. Even my mother-in-law can understand and would explain to Mayenne about the good and bad things that each character did during the 10-minute episode. Personally, I have always been fascinated by the stop-motion animation technique perfected by Aardman since Wallace and Gromit. Like many less-popular cartoons, local retailers do not carry this toy, but it didn’t take me long to find the toys to brighten my daughter’s days over eBay. Fortunately, this cartoon was a hit in UK, the country of origin, so there are quite a few official products for me to choose, albeit limited variety. Within a week of order, they arrived safely in my mailbox. 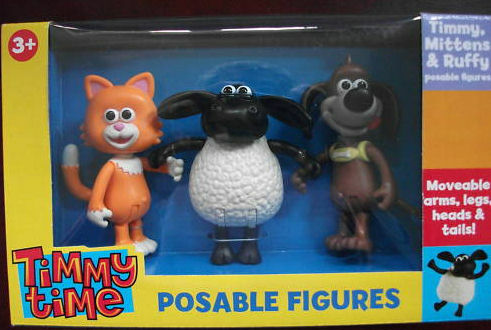 I bought this set of posable figures from the animation (strange why only this 3 out of the 12 animals are available), which costs less than S$30 including shipment. Made of quality plastic. they look absolutely identical to the cartoon, something that pleases me a lot as a collector. The size is good for a 3-year-old, although I wonder if Timmy and Ruffy’s ears can withstand Mayenne’s rough hands. All the heads, limbs and tails are posable, but not the ears. Mayenne couldn’t keep her eyes and hands off the figures. Did I also mention that she can sing the theme song already? Let’s sing along! Catch Timmy Time on StarHub Cable Channel 311 Playhouse Disney every weekday at 9am and 8pm.